Mr Nyusi flew over some of the worst-hit areas on Monday. He described seeing bodies floating in the rivers. The storm made landfall near the port city of Beira on Thursday with winds of up to 177 km/h (106 mph), but aid teams only reached the city on Sunday. A UN aid worker told the BBC that every building in Beira – home to half a million people – had been damaged. Gerald Bourke, from the UN’s World Food Programme, said: “No building is untouched. There is no power. There is no telecommunications. The streets are littered with fallen electricity lines. 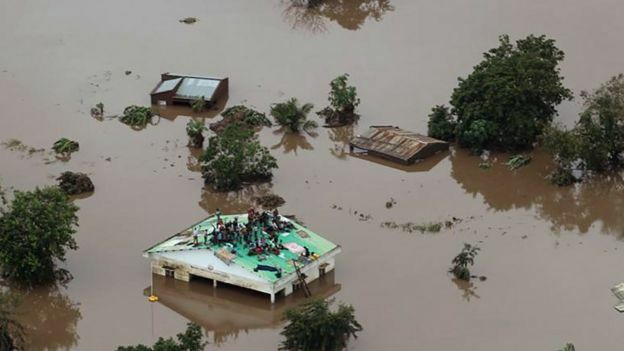 The official death toll in Mozambique stands at 84 following flooding and high winds. The cyclone has killed at least 180 people across southern Africa. The International Federation of Red Cross and Red Crescent Society (IFRC) described the damage as “massive and horrifying”. People have had to be rescued from trees, Jamie LeSeur, the head of the IFRC assessment team, told the BBC. The death told included two pupils from the St Charles Lwanga boarding school in the district of Chimanimani, who died after their dormitory was hit when rocks swept down a mountain. Malawi was also badly hit. 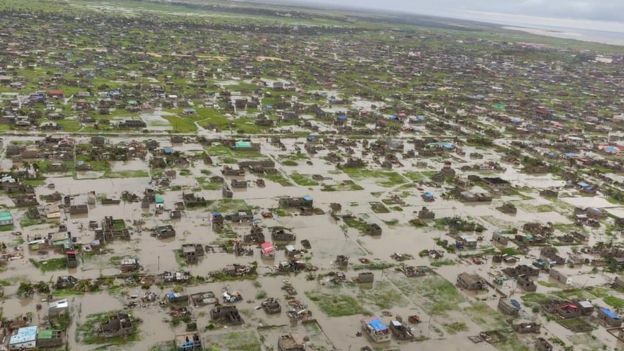 The flooding there, caused by the rains before the cyclone made landfall, led to at least 122 deaths, Reliefweb reports. The UK government said it would provide humanitarian aid worth £6m ($8m)to Mozambique and Malawi. It also said it would send tents and thousands of shelter kits to Mozambique. Most of those known to have died so far were killed around Beira, the country’s fourth largest city with a population of about 500,000, authorities there said. 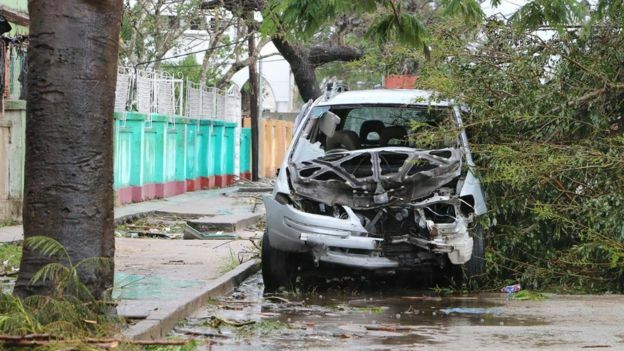 More than 1,500 people were injured by falling trees and debris from buildings including zinc roofing, officials in the capital Maputo told the BBC. 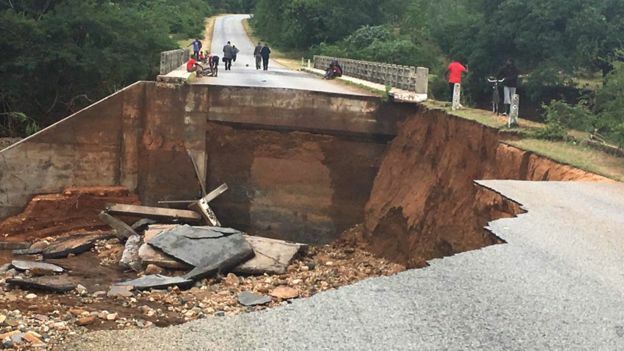 Local people in Beira have put in an “incredible effort” to reopen roads in the city, Mr LeSeur told the BBC’s Newsday programme. The road linking Beira to the rest of the country was damaged, but air links have now resumed. President Filipe Nyusi cut short a trip to eSwatini, formerly known as Swaziland, to visit the affected areas. What’s the situation in Zimbabwe? A state of disaster has been declared in Zimbabwe. President Emmerson Mnangagwa has returned home early from a trip to the United Arab Emirates to “make sure he is involved directly with the national response”, the authorities say. The ministry of information has shared pictures of pupils from St Charles Lwanga School, who have now been rescued. 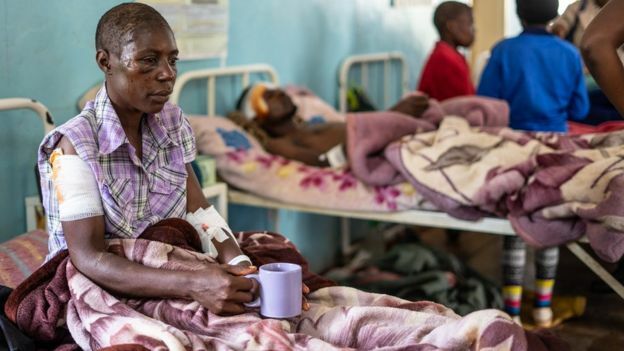 Shocked survivors at a hospital in Chimanimani district told how the floods destroyed their homes and swept away their loved ones. Praise Chipore’s house was also destroyed. “My daughter who was with me in bed was washed away from me and a bigger flood carried me further away,” she said. My journey to Chimanimani ended abruptly when we came across a huge crater in the road. The river was raging below and scores of people were standing on either side. This was the main road linking the city of Mutare to the villages of Chimanimani, which have been cut off. Aid teams have been unable to get through. People who live in this area say they have never seen anything like this. An elderly couple, Edson and Miriam Sunguro, told me that they have been trying to contact relatives in Chimanimani without success. What will the weather do next? 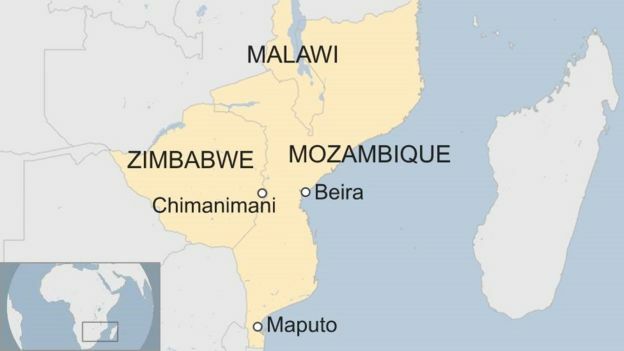 “There is a risk of more rain over the next few days for the northern half of Mozambique and southern Malawi,” BBC Weather’s Chris Fawkes says. There could be thunderstorms, he adds, but “the picture is complicated by thick layers of cloud left over from Idai that could prevent some thunderstorms from starting”.